ELOQUENCE dipole sattelites and TURBULENCE LAT 2800 woofer towers - Ground Sound digital active cross-over and poweramps. This is a really big speaker system. I have made my fair deal of small 2-way speakers. But now I want a full-range reproduction as well as high sensitivity. Going active is one way to do it. I think it is the only way to do it! Especially when it comes to the interface between amp and woofers. With the Danish Ground Sound system you get a modern digital cross over with all the functions you expect of a moderne system. 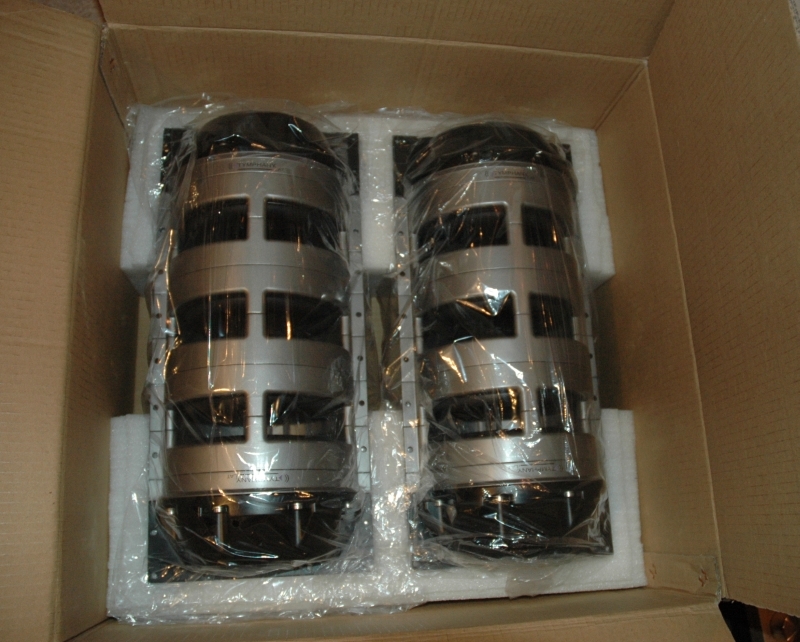 The 8 LAT 700 drivers arrived packed in pairs. One box as seen in the picture on the right weighs in at approx 32 kgs (60 lbs). Right: The first trial set-up. One LAT in the bottom, just to see how it will look. Left: Alle 4 LATs are mounted. 110 kgs (210 lbs) speaker tower but still manageable. The half finished 2nd tower on the side with a Hans Thessink CD to show the size. The mid/tweeter range dipoles each have two Accuton ceramic drivers - C2 90 - 8 ohm 93 dB. With the two in parallel the resulting sensitivity will be approx 96 dB/4 ohm. They will reproduce the 225 Hz to 2.200 Hz range. The Accutones are powered by my Accuphase A60 class A amp. The x-over and the EQ-correction has been done with the Ground Sound DCN23 (see below). Close field with no correction or cross-over. Showing a reasonable linear output to about 500 Hz. A 220 Hz/4th order low-pass has been added. 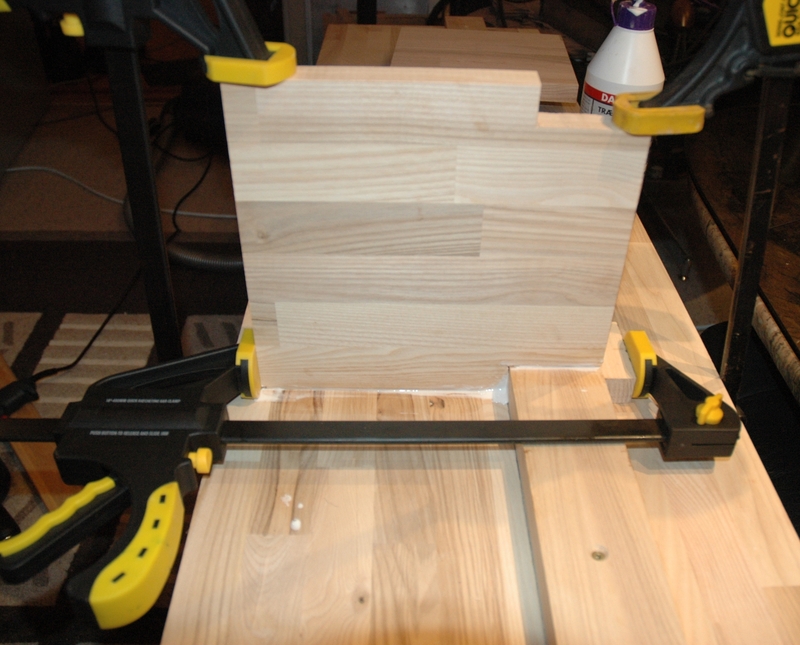 To equalize the dipole drop off a 12dB/octave shelving has been added from approx. 80 Hz. A sharp cut at 15 Hz/24 dB remove the very low subsonic frequencies. The top ribbon is a modified Aurum Cantus G3. 102dB/1 Watt. The ribbons are powered by my Audio Note Kegon (copies) PSE 300 B amplifiers. 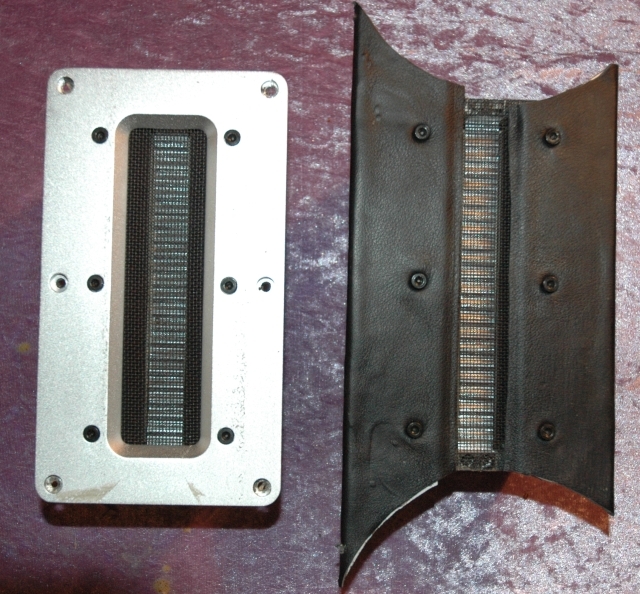 Here the original G3 Aurum Cantus ribbon on the left. With the new leather covered baffle designed, so the two midrange drivers can be mounted closer together covering the top and bottom of the ribbon. 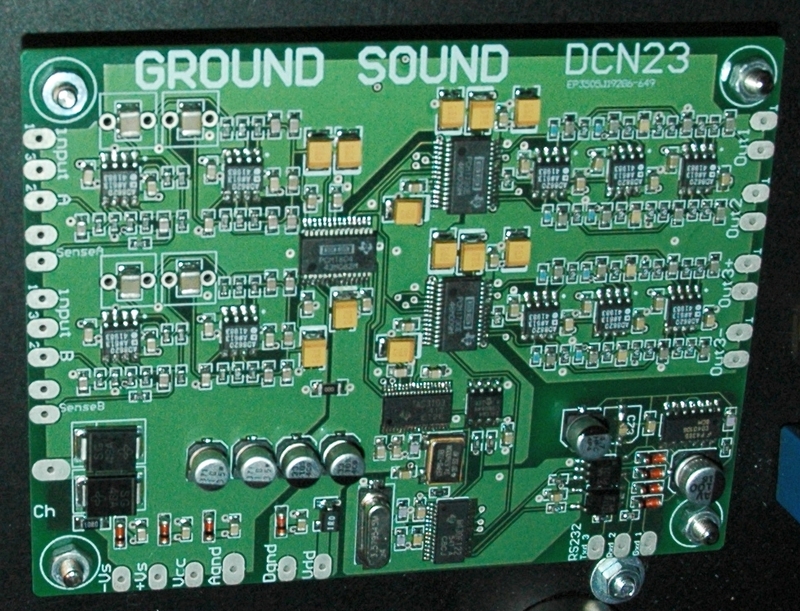 The Ground Sound DCN23 - 3-way 24 Bit/96 kHz digital cross-over. What does it do? Everything! Cross-over, equalising, phase and timedomain correction and with the X-over Wizard programme cross-over optimizing. 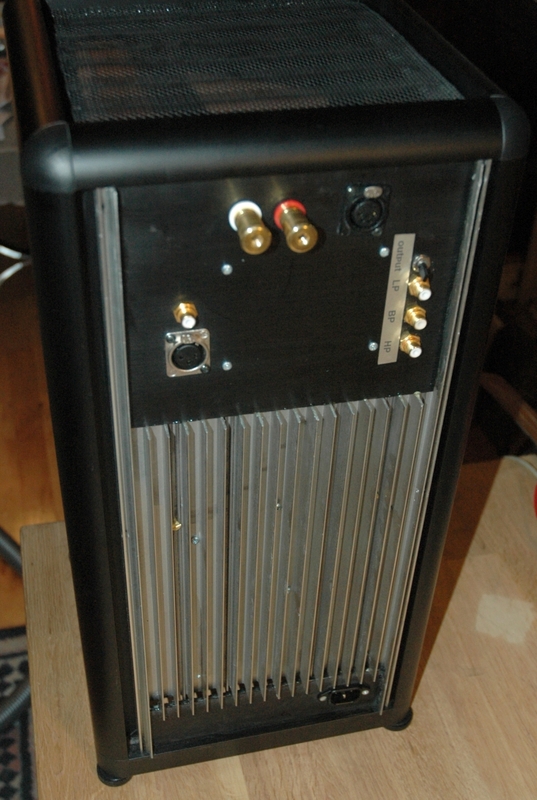 The Ground Sound PA33C - 200 Watt/8 ohm power amplifier. The amp will deliver 400 Watt in the 4 ohm load LAT woofer-towers. The Ground Sound PSU and controll module. Auto on/off and slow turn on of the big toroid. 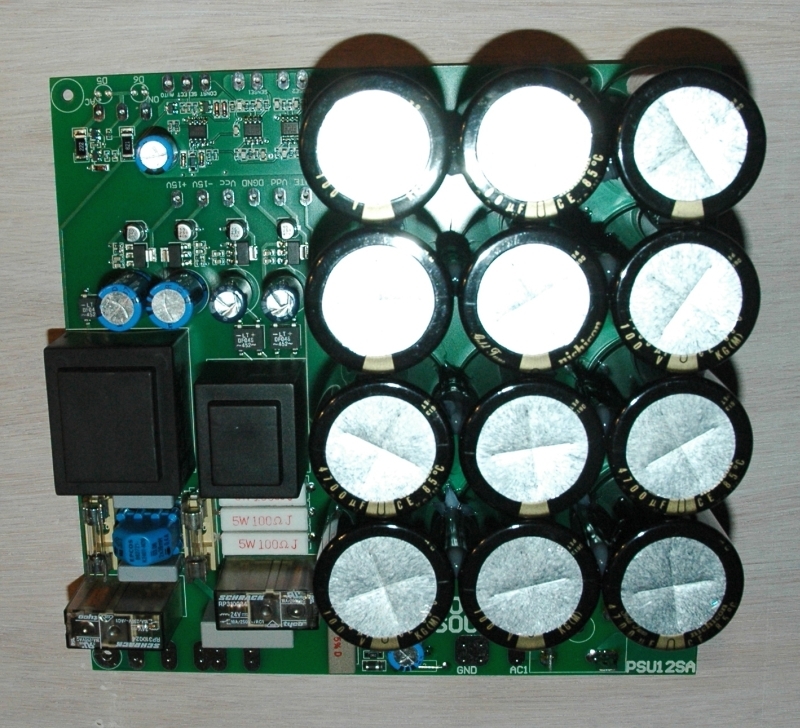 12 x 4700 uF/100 Volt electrolytics for the power-module and 2 x PSU for the digital and analog circuits on the DCN23. Far right: The total mono amp/x-over tower, which will be placed behind the speakers. Each tower has a 1500 VA toroid. Output is 2 x 48 V AC. 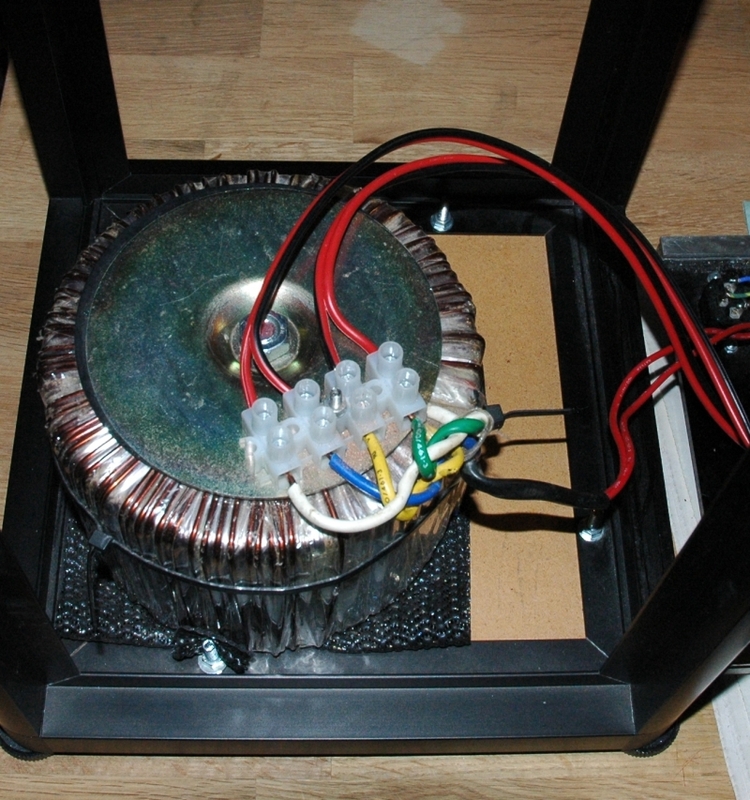 After the rectifiers there will be +/- 65 Volts on the PSU capacitors.